The primary election cycle, that is. We now have reached the stage in the Republican race where a guy (Mitt Romney) is getting heat for how much money he made and what his tax rate was. Do we prefer to have somebody who was a failure in life run the country? Here’s what I mean. Say you’re at a horse race track and two touts come up to you with tips on the next race. Who are you going to listen to -- the guy with in the ratty jacket, dirty shirt, wrinkled trousers and holes in his shoes, or the guy who is neatly dressed wearing a real Rolex? From what I hear from some of the Romney’s critics (hello, NBC and your cable outlets) is they would go with the guy with the dirty shirt. And if Romney didn’t pay the same tax rate as Warren Buffett’s secretary, whose fault is that? Apparently, he (or his accountants, to be more precise) paid exactly what the numbers called for. Any beef should be with the tax system, not Romney. But not according to the media. Hell, a piece in the Atlanta Journal-Constitution is whining about where Romney got his money and pointedly notes none of it came from wages, as is customary with most of us common folk, it adds, almost sneering. Is that a sin now? I’d like to have had a life where I could have lived off money earned by my investments, but so far I haven’t gotten a decent return from my lotto tickets. To show how slanted the piece is, it even tempers something in Romney’s favor, that he donated $7 million to charities over the last two years, with the qualification that most of it went to the Mormon Church, as if that should discredit him. I would say anyone who supports his church financially the way Romney has his should be congratulated, not scorned, no matter what church it is. I also have a problem, quite frankly, with the conclusion in the piece that states the effective tax rate for Romney’s returns for the last two years is 13.9 percent. (The DNC has picked up on this as well. Surprise, surprise!) The genius who wrote the piece apparently got that figure by dividing the amount Romney paid in taxes by the total of his gross income. Ummmm. That ain’t the way it works. None of us pays taxes on our gross income. We all have inductions, whether they are itemized or we use the standard deduction. We then pay taxes on the net. I guess that’s why the piece uses the words “effective tax rate” cause it isn’t the real thing. Of course, if the media bothered to do math right, the tax rate would have jumped. Just deducting the charitable deductions from his gross and then doing the math would result in a tax rate of 17.1 percent, and that doesn’t begin to include his other deductions. I’ m just guessing here, too, but I’m thinking if you earn your money from investments, which will have at least some risk, you’re probably going to have more to deduct than someone on a salary. Whether that is right or wrong can be debated elsewhere. Right now it’s the system we got. Don’t get me wrong. I’m not necessarily for Romney, though I must confess that I would prefer him or anybody else (well, not sure about Ron Paul) over the Democrat candidate. Wait. I have gotten off my original point here, which is that the primary campaign, which started, if memory serves, about the time since the Cardinals won the World Series (not the 2011 Series, the 2006 one), has gone on far too long. I think we should go back to the old days when nominees came out of smoke-filled rooms. Go back and check out movies like The Candidate (1972, Robert Redford) or The Best Man (1964, Henry Fonda, Cliff Robetson), though the best political movie in my mind didn’t involve a presidential race. The Last Hurrah (1958, Spencer Tracy) is a real classic about an aging mayor of an unnamed U.S. city (one thinly disguised as Boston) running for reelection. Or read The Making of the President 1960 by Theodore White. (It’s the first and the best in the series.) and you’ll see what I mean. Of course, that’s not going to happen. Smoke-filled rooms are hard to find nowadays. Plus, all the political pundits on TV would be out of business and have to get a real job. Say, that’s a benefit I hadn’t thought of. Maybe they could invest in something. IT’S CONVERTIBLE WEATHER! WELL, AT LEAST WHERE I AM IT IS! Not to rub it in with any of you living up north, but it’s convertible weather where I live. The temperature is starting in the 70s and working its way to the low-80s during the afternoon, and the sun is bright but not overbearing. You can sit at an intersection without getting a sunburn. Perfect weather, in other words. And I have just had the perfect car for it. The Infiniti G Convertible Sport 6MT with a six-speed manual transmission. The perfect combination. Life just doesn’t get any better. Infiniti offers buyers the choice of two engines in sedan-form G models -- the G25 with a 2.5-liter V6 and the G37 with a 3.7-liter V6 -- but only the 3.7 in coupe and convertible models, hence the G37 S tag on the trunk lid. The 3.7-liter pumps out 325 horsepower and 267 pound-feet of torque to the rear wheels, which results in a lively performance for the driver. It drinks the good stuff (premium fuel is listed as “required,” not just “recommended”) at a rate of 16 miles-per-gallon city, 24 highway with the manual, 17/25 with the automatic transmission. The G37 Convertible also has a choice of two transmissions, a seven-speed automatic and a six-speed manual. I think the company shows it is very much in tune with its prospective customers when it charges a premium for the manual over the automatic. It's usually the other way around, but in this case, the MSRP for the automatic is $46,400, for the Sport 6MT $50,850. Some people, of course, think that when you’re driving in a lot of stop-and-go traffic -- and who isn’t these days? -- it becomes a chore to constantly have to work the clutch with the manual. I don’t, certainly not with the easy throws when it comes to shifting in the G37. The roof lowers and raises with a simple push of a button on the center console, that is, it does if the rear gate is in its proper place. It’s not big deal to set it right. All it does is ensure you don’t have any extra items in the trunk that would be crushed the top as it folds up on the trunk. Naturally, you lose all your trunk space (though there was still room for the thick owner’s manual, however) when the top is lowered. Frankly, there’s not a whole lot there to begin with, just over 10 cubic feet overall. That small trunk is about the only negative thing I could see in the G37. But you've got to expect that in a convertible. If you want a cargo hauler, get an wagon or SUV. This one is built for hauling. ... never mind. The G37’s ride is sporty and it handles corners well, but at the same time, it is comfortable going over bumps like on railroad crossings as well. No jarring of the teeth, and no rattles anywhere else. The cabin is nicely done and has the quality materials and all the bells and whistles you usually find in this price range. Infiniti made the navigation system, which is pretty easy to operate, standard in the Sport 6MT trim level. Two-way lumbar support in the driver’s seat -- power adjusted, of course -- also is standard in the Sport 6MT, a welcome feature for those of us with aching backs. In fact, you won’t find a lot of options available on the Sport 6MT because so many things you might want are standard, which means not a lot of expenses added to the base price. The model I drove came with the nav system with backup camera, Bose audio, Bluetooth, XM Satellite radio (three months subscription; after that, you pay a monthly fee) and more included in the base price. The only extra was illuminated kick plates, which added $340. That and the $895 for destination and delivery (which should be included in the MSRP but never is in the industry for some reason) ran the total tag to $52,085. Maybe if you are a savvy negotiator, you can get the dealer to throw them in free. If you’re not, like me, go ahead. Splurge. Life’s too short not to live it up a little! And don't worry. It will be convertible weather where you live sometime soon I’m sure. Maybe June, when hurricane season opens here. WHY DOES HOLLYWOOD HAVE TO TINKER SO MUCH WITH HISTORY? I finally saw Moneyball the other night. Yes, yes, I know, I am late to this party, but for me to see a 2011 movie in January 2012 it’s like a regular moviegoer going to the Hollywood premiere. I don’t see many movies these days until they come out on DVD. Hey. I just realized something. I must have been one of the first to get the movie from Netflix! That should count for something. Anyway, Moneyball is the story of how general manage Billy Beane turned the Oakland A’s into winners by ignoring traditional baseball figures (batting average and RBIs) and going by the new numbers put forth by the so-call statistical genius Bill James, who rates the most important thing about a player not his batting average but his on-base percentage added to his slugging percentage (OPS). That probably would have gotten me to watch it by itself, but I also was interested because of Beane. I had seen Beane pay when he was with the Class AA Jackson Mets back in the early 1980s and I was the sports editor of the Clarion-Ledger newspaper. I found the movie, which stars Brad Pitt, who also is the producer, enjoyable and interesting, and it’s not a bad way to spend a couple of hours. Much better than the Red Box a friend of mine is always talking about. Just don’t take it literally. When I first saw this movie previewed on TV (since I don’t go to the movies), the first thought that crossed my mind was this: What have the Oakland A’s won recently? They have yet to make it to a World Series and they have been to the playoffs only twice since the time setting of the film, which was in 2002 when they won 103 games but lost in the first round of the American League playoffs. They made it back in 2003, but have done so only once since then (2006). So I’m not sure if the premise of the movie, that Beane unleashed this great revolution on the baseball world, is all that solid. 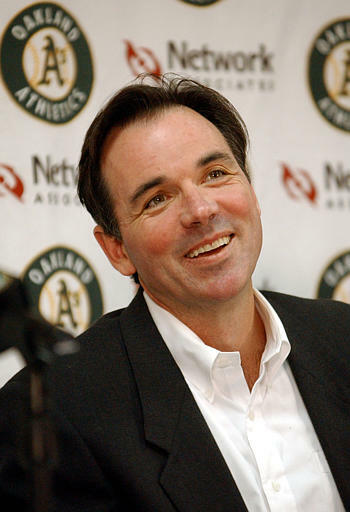 At the end, a tagline cites that the Boston Red Sox used the same principles Beane followed at Oakland to build their 2004 World Champions, which kind of seemed rather lame. Still, the numbers and theory is interesting, and if there’s anything a baseball fan likes better than numbers I’m not sure what it is, unless it is different interpretations of numbers. It’s not just that that bothers me about the movie, though. No, it’s the toying the writers do with the story. Actor Philiip Seymour Hoffman as Art Howe. A’s manager Art Howe is treated brutally, and several incidents are portrayed inaccurately. For instance, in a radio interview available on the Internet, Howe notes that it was he, not Beane, who broke the news to a player he was being cut (and just five days before he would have qualified for major league baseball’s lucrative pension, something the movie ignores completely). No. 1, his agent always handled Howe’s contract negotiations, and Howe would not have approached Beane in a hallway in the training complex to confront him about it. No. 2, Howe didn’t need a one-year contract extension in the first place. He was already covered for 2003 because of the rollover provision in his contract. Frankly, I’m not sure why the scene was in the movie in the first place other than to try to make Howe out as more of a villain. The movie people had to create some sort of conflict to make Beane more of a hero, I guess. At the end of the credits, it is explained that some characters and incidents have been changed for dramatic effect -- shoot, even the name of Beane’s assistant was changed, not to mention the movie has him coming on board just before the 2002 season when he actually had arrived in 1999. It always disappoints me when Hollywood people decide they have to jazz up a story because the truth, in their eyes, isn’t dramatic enough. Hollywood did it with Glory Road, the story of Texas Western’s basketball season that ended with a team of five black starters beating Kentucky’s all-white lineup in the final game for the NCAA champioship. The movie begins with Don Haskins supposedly beginning his first season as coach when he had been there for five years. Some of the players he (in the movie) brought to El Paso (the school now is the University of Texas-El Paso, or UTEP) that 1965-66 season had already been there for a year or two, and there was no playing of “Dixie” or Confederate flags waved at the national title game as the movie shows. 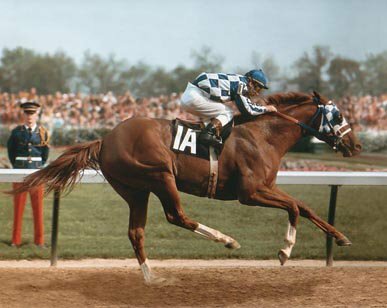 Secretariat is an overall entertaining movie, not to mention a great horse, but it gives you the impression Penny Chenery’s Meadow Stable would have gone under had not Secretariat come along at that moment. Actually, Riva Ridge had done that the year before when he won two (Kentucky Derby and Belmont Stakes) of the three Triple Crown races, losing only in the Preakness. That’s what the makers of Field of Dreams said when baseball fans criticized them for making Joe Jackson a left-handed thrower and right-handed hitter (a rarity in baseball; Rickey Henderson is the only good one who comes to mind) instead of the other way around. But nobody thought Dreams was anywhere near a true story. (I don’t think.) 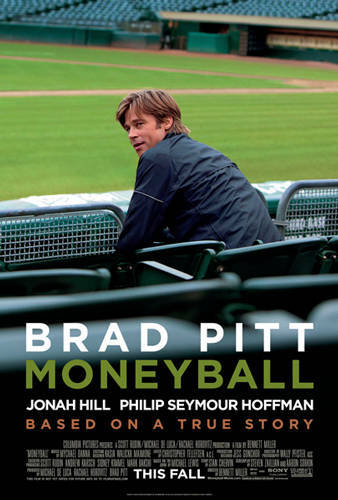 Moneyball and those others I mentioned are supposed to be telling you the story of something that actually happened. If they want to add character composites or add things for the sake of drama, then go the extra step and really fictionalize it, like Hoosiers. Did the changes made to Moneyball, Glory Road and Secretariat really add anything to their stories? I don’t think so. I’m looking forward to seeing Red Tails (probably next year on DVD). I hope it sticks to the truth because it’s a great story (first told in a TV movie back in the '90s) that needs no embellishment. I hope I don’t see a scene where some white Army Air Corps colonel is sitting in his office whistling Dixie and sitting in front of a Confederate flag as one of the black pilots from Tuskegee approaches him. Unless that really happened, of course. This is the 2011 Lexus GS 350. Like other models in the Lexus lineup, it is a nicely styled, attractive car built with quality materials and filled with lots of user-friendly technology. The navigation system is arguably the easiest to use and with the best display, and the radio and A/C don’t require a Ph.D to operate. What makes the GS my favorite Lexus, however, is this way it drives. For the longest time, I found Lexus models like the LS, ES, and even the IS very comfortable vehicles to ride in and very high in styling. The RX I thought was the best-looking SUV on the road. But they simply didn’t get the juices going when you got behind the wheel and hit the accelerator. That impression changed when I finally got to drive a GS. I wish I could tell you exactly when that was, but it doesn’t matter. It was several years ago, and my latest experience didn’t change my impression that this is a vehicle that adds some punch to typical Lexus poshness. The standard GS comes in two sizes, the 350 with a 3.5-liter V6, and the 460 with a 4.6-liter V8, plus a hybrid model that is built more for extra power than for fuel savings, which likely would come as a jolt to someone seeking a hybrid for its mileage. More on that hybrid in a moment. A six-speed automatic transmission with the capability of manual gear selection is standard in the 350, and the 350 is available in either rear-wheel or all-wheel-drive configuration. The 460 comes with an eight-speed automatic and RWD only. The engine in the 350, which is what I drove, pumps out 303 horsepower and 274 pound-feet of torque, which, according to company clockers, will move you from a dead stop to 60 mph in 5.8 seconds. Considering that you gain less than a half-second on that time by going with the 460, not to mention losing a couple of miles-per-gallon on the 19/26/22 that the V6 offers, I frankly don’t see the benefit gained by plunking down the extra $8,470 that the 460 adds to the 350’s $46,900 base price tag. For that matter, neither do I see any attraction in paying an extra $12,050 for the hybrid when the 2011 delivers fuel “economy” of only 22 miles-per-gallon city, 25 highway. If you do the figuring, it would take pretty much the rest of your life to make up the savings with the hybrid over the fuel costs for the GS 350. The GS 350 comes in only one trim level offering standard features like 17-inch wheels (18 on the 460), HID headlamps, dual exhausts, a one-touch open/close moonroof, power trunk closer, 10-way power adjusted driver and front passenger seats, a roomy backseat area, and all kinds of safety features. One feature that is a nice touch: Lexus has put the controls for lesser-used functions, like adjusting the side mirrors, into a drop box on the far left of the ash. This helps give the interior a cleaner look with fewer buttons and switches instead of making the cabin look like the inside of a 757 cockpit. Among options are two navigation systems. The Lexus HDD system features Bluetooth capability, Lexus Enform (automatic collision notification, stole vehicle location, emergency assist button, enhanced roadside assistance and a one-year subscription to Destination Assist and eDestination), a backup camera, and a 90-day trial subscription to XM NavTraffic/Weather and Sports and Stocks. With the Mark Levinson Premium Sound system with navigation, you get all that plus, well, the premium sound system with 14 speakers. In other words, you’re getting luxury as well as performance, which is something Lexus is beginning to catch onto. The IS 250/350 now offers an upgraded performance in a slightly smaller package than the GS, and the IS F ($61,300) and LFA Coupe ($375,000) kick up the fun a couple of more notches. The problem is that the Japanese automaker has been lagging behind its European competitors in the luxury performance field for so long it’s going to take a while to catch up. Lexus is launching an all-new GS for 2013, skipping the 2012 model year in nomenclature, in February, moving the sedan into its fourth generation. An all-new hybrid version also is due to arrive in the spring with mileage boosted to 29/34/31. That makes a little more sense, but not enough to get me off the 350. Volkswagen has an extended portfolio now that features sedans, hatchbacks, wagons, minivans, SUVs, and even a hardtop convertible. But there was a time and not so long ago that if you mentioned the German automaker's name or referred to a VW, you were talking about one vehicle. From the time the first production Beetle rolled off the assembly line in 1938 and just past the turn over the century, more than 21.5 million Beetles were sold around the world, making it the most popular car manufactured off a single platform of all-time, according to company publicists. No doubt, the Beetle hit is zenith in popularity in the 1960s, when it identified readily as the “people’s car” with the emerging hippie generation. But its success and appeal began to wane in the ’70s with the emergence of many more attractive compacts and subcompacts on the market, many coming from, ironically, Germany’s old World War II ally Japan. The Beetle virtually disappeared from the American market in the 1979, when production in Germany was halted. But it continued to be made in Mexico and other plants around the world on a stop-and-go basis through the 1990s. Finally, in 2003, the last of the air-cooled, rear-engine Beetles rolled off the assembly line in Mexico. By then, however, VW already had introduced to wider audiences its New Beetle, which had its water-cooled engine in the front but took on many of the readily identified signatures of the original Beetle in shape and appearance. The 1998 New Beetle even paid homage to its past with the placement of a small, tubular bud vase attached to the dash. Ah, where have all the flowers gone? It’s a bit wider (3.3 inches), longer (6.0 inches), and lower (0.5 inch) than the New Beetle -- for the record, the 2012 Beetle may be new, but it is no longer the New Beetle when it comes to nomenclature, just plain old new Beetle -- and that results in slight more interior volume for the passengers (85.1 cubic feet to the old 84.3). A turbocharged diesel version is coming out later this year that will help the torque figure to a whopping 234 lb.-ft. and increase fuel economy figure from the 22 city/29 highway neighborhood for gasoline power to 29/40/33, making it the most fuel-efficient Beetle ever. I drove the 2.5L model with an automatic transmission with a panoramic sun roof and navigation system, the first nav system to be offered on the Beetle. It’s one of four trim levels offered in the Beetle, which run in price from $18,995 to $24.195. It’s a fun car to drive, though I would prefer a manual transmission over that automatic even though it does have manual shift capability. Not neck-snapping getaways, but quick enough if you work it right. If you’re interested in more performance, you might want to try out the turbo version or wait for the diesel and its advantage in torque. The interior is nicely designed and functional. The flat-bottom steering wheel has redundant, easy-to-use audio controls, and the climate control works off large buttons placed underneath the audio display in the center of the dash. Hmm, speaking of the dash, I liked its red wrap-around, contoured appearance with the upper and lower glove boxes on the far right. Nice and clear, it gives the interior a kind of space-age look. The radio was easy to operate as well, always a big plus in my book. As for the navigation system, I’m not too sure about it. For one thing the screen is small, very small in my book. It looks kind of like many of the screens on some Garmin systems, but it’s not a Garmin. It is is supplied by a firm called Technisat, a German manufacturer. It’s not that difficult to see the road details because of the large scale, but at the same time that large scale cuts down on the size of the area that can be displayed. Still, if you are driving in a strange or unfamiliar area, it’s better than nothing. It was easy to enter a destination, but it was either my mistake in typing in the numbers or a system flaw that took me several blocks past my hotel when I gave it a try. I tried to go back and check to see I could verify what numbers I had typed in, but the system wouldn’t let me do it. Just put it down as my mistake. The system also had the annoying habit of advising me to continue on the same road from time to time as I made my way north on I-95. Note to programmers: If you don’t tell me to take a freeway exit or make a turn at some point, you don’t need to remind me to keep going straight on an interstate. It kind of reminded me of this: www.onionsportsnetwork.com/video/nascar-coach-reveals-winning-strategy-drive-fast,14154/. I didn’t actually ride in the backseat, but I did venture back there, and it’s not as bad as you might think. It’s not that difficult to get back there in the first place, which is half the battle in a two-door, and it wouldn’t seem to be too cramped for shorter jaunts. Not sure I’d want to go all the way cross-country riding back there, but for smaller children I wouldn’t see a problem. Cargo capacity is fine for most chores (15.4 cubic feet), but you gain only another 14.5 cubic feet by folding the rear seats. Overall, I would have to say the new Beetle is a worthy successor to the New Beetle and serves its heritage well. I don’t see Volkswagen selling 21.5 million of them over the next few decades -- too many other choices on the market today. But it should get a hefty number. Having finally gotten back from a holiday trip and into the usual routine, I was going to write about something else today. I was thinking on my walk about how the people who run college football have completely fouled up the bowl games, which should have all finish up yesterday (January 2) but now will extend to next Monday night when LSU and Alabama play for the national championship in the Tigers' backyard in New Orleans. I also have a couple of cars I want to comment on, including the VW Beetle I drove last month. But this is just too good to pass up. We paid off a credit card bill last month, but when we got the followup statement after I collected our mail, there was another small amount as an interest charge. So I called the 800 number on the statement to see what the deal was. After punching in the last four digits of my account number (If that’s all they need, why are all those other numbers there?) and zip code and then hitting all the right buttons to get through the phone answering maze, I finally got an agent. For a moment, I just couldn’t say anything. She allowed as how she had gotten reactions similar to mine from other customers, but she enjoyed having the name, even though the “Peggy” in the credit card ads on TV is not exactly a very good example of credit card service. I have to admit that sounded like something the bad “Peggy” would say, but as long as she was tending to the matter I was happy. I wonder if this is a sign of the way things are going to go this year.